Calling all scallop lovers, this festival was created with you in mind! 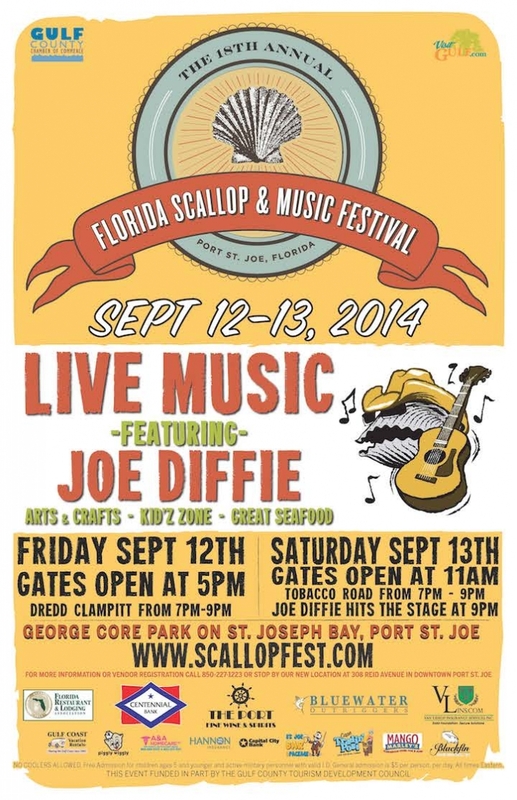 September is prime scallop season and there’s no better way to enjoy this seasonal seafood delicacy that at the 18th Annual Florida Scallop & Music Festival held September 12-13, 2014 in quaint Port St. Joe. Highlights of the family-friendly, two-day event start with sampling some of the best, mouthwatering bay scallops you’ll ever sink your teeth in. Mmmmmmmm. Plus, there will also be an assortment of other foods available, perfect for nibbling and strolling around the scenic grounds of George Core Park that overlooks beautiful Port Joseph Bay. If you have the kids in tow, be sure to stop by the popular kids zone and numerous educational exhibits, which should keep them thoroughly entertained—and keep you happy! Oh, and for your arts and craft fans, you’ll want to check out the vendor booths. You never know when you’ll find that one-of-a-kind-treasure you’ve been searching for. It wouldn’t be a festival without great music and the 2014 line up of live entertainment promises not to disappoint. Friday night’s featured act for the Battle of the Bands regional competition, is Dread Clampitt, who performs at 7 p.m. CDT. Revered along the neighboring Emerald Coast for its eclectic blend of bluegrass, rock, jazz, blues and Cajun funk, Dread Clampitt is sure to get you groovin’ to the tunes! Festival gates open on Friday at 5 p.m. CDT, so bring you beach chairs and blankets and grab a good spot. On Saturday, the gates open at 11 a.m. CDT and various musical acts will perform throughout the day. Then at 7 p.m. CDT the starts come out—country stars, that is! The first of the evening’s double headliners is The Tobacco Rd Band, featuring CMT touring artist Eric Durrance, who formed the band back in 2010, and has a growing fan base that just won’t quit. 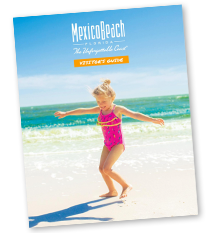 “For you country music fans, this is one concert you shouldn’t miss!” said Kimberly Shoaf, president of the Mexico Beach Community Development Council. Festival parking is free, as are admission tickets for children 6 and under and military personnel with proper I.D. General admission tickets are $5 per person, per day. Limited V.I.P tickets are also available for Saturday night and include a catered seafood buffet and full bar for $50 per person. For more information about the 18th Annual Florida Scallop & Music Festival, visit our Calendar of Events, call (888)723-2546, or email to info@mexicobeach.com.